A storyteller with words, art and heart. Last night my daughter called. There doesn’t seem to be a flat rock in the middle of our lives where we can just sit in the sun and be still for a while. “It’s an icky place to be,” I said. I woke this morning with a familiar flutter in my chest, about two degrees of stress away from a panic attack. It sort of feels like too much caffeine, only I haven’t had any yet. Last Sunday afternoon my brother called. Mom was afraid and had called the police. Dad was angry and combative. About six hours later he was admitted to a hospital room. On Monday Dad’s nurse called me to come get Mom. About five hours later she was admitted to a room around the corner from Dad. They both have some form of dementia. It doesn’t matter which kind, they’re impaired. Their bodies have outlived their minds and that just doesn’t seem fair. On Wednesday I went to their house to remove anything that burglars might want and to bag up what might need laundering. I filled the hatch of my car with boxes of files, anything that looked like an important document. I left the four leaf bags full of laundry on the living room floor. I put two leaf bags full of ruined bedding in the trash. On Thursday I went back and removed boxes of photos, more documents, stacks of mail, folios of papers: my dad’s military records, my mom’s notebooks. I went home and began looking for the money. A memory care facility for both of them is going to be expensive. By Saturday afternoon I had it all sorted. I had discarded enough paper to fill the garbage cart: junk mail, magazines, empty envelopes. Mom’s carefully collected recipes are on the kitchen table. Boxes of cancelled checks and insurance policies and medical records litter the living room floor. My parents never owned a computer. My dad has an Underwood typewriter that uses a ribbon. Among his stuff I found a box of typewriter erasers and brushes and several packs of carbon paper. As I type this I am thinking that some of my readers will not know what these things are, and I can feel them Googling now. “Have they ever been apart?” my brother asked. “In the ’60s Dad went on active duty for two weeks,” I replied. I took my parents some clothing during visiting hours. They were sitting in the hall with another patient, in chairs lined against the wall across from the nurses’ station. 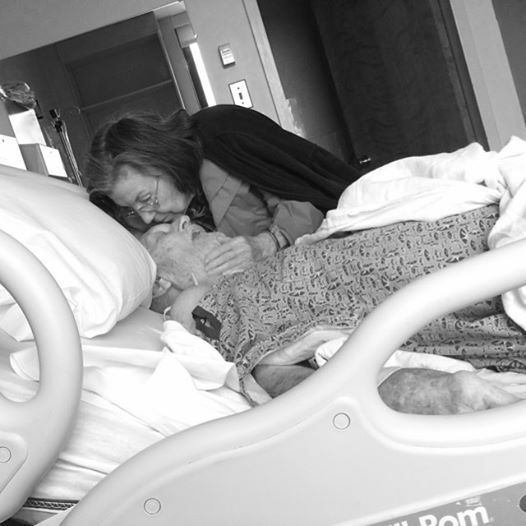 Mom now talks of nothing else but caring for Dad. His welfare is her only need. She asked me to help her find a place for them to live. When she began to weep, I cradled her. She rested her head on my shoulder like a little girl and quieted. Her body felt like delicate glass that might shatter at any second. Dad slowly brought me into focus and smiled. He was too groggy to speak, but he winked at me. To this day it thrills me when he does that. Mom rose from her chair to wipe his lips with a corner of his blanket. She smoothed his hair and kissed him on the mouth. “We want to keep the lovebirds together,” their doctor said. obsessive yarnmistress and incessant dreamer, disguised as a graphic designer. Recipes are my creations, unless noted. other creative channels involve weaving, painting, writing, blogging, beads and wire.